Just another boring day in the office ahead. But doesn’t I like awesome! Come on. Giv’me some cred! Heh, heh, heh…I get it! Very clever! Mr Fitzwell looks swoonsome in his impeccable suit. Not only that his brogues and knitted tie add flair and personality. Really first rate. Many of the features you’ve mentioned during the last year but well tailored, balanced and put together without too much fuss or grandstanding. Real world excellence. no explanation. got it loud and clear. mr. fitzwell indeed! his alter ego is mr. looksgood. The perfect fit of the suit. Nice burgundy broques. The knitted tie and aviator sunglasses make a casual accent for dress. i really like what this man is wearing and i don’t find it boring at all…he knows how to wear this kind of clothes…i like the sun glasses and his shoes which have something different from the rest of the look! A sharp dressed man. I like the clean cut vibe. I also like how he combined the navy pinned-striped suit with the dark brown shoes. The aviator shades are a nice accessory to finish off the look. How can you lose? Everything’s perfect. A little somber, perhaps; but still perfect. I agree with Jorge. . .the pants are too short for my taste. I know that’s “the look” now, but I don’t care for it. It looks undignified, somehow. Otherwise, he looks nice enough but not very interesting. He looks like a secret service officer. Hope he’ not an investment banker! I know what I’m asking Santa for Christmas. I wish you would do some pairs of photos that show men and women looking similarly “master of the universe.” Guys like this look hot and intimidating and professional. Can women pull this off? Perfection. Maybe some of the quirkiness a few of you are looking for are in mr. fitswell’s personality… wouldn’t that be fun? He belongs in the pages of Mens Vogue for sure…. or maybe in my kitchen sipping some wine after a long days work…. Oh, this is almost too much for me this early in the morning, before coffee. Mr. Fitzwell must work for the secret service…. Great picture of a regular office worker in sun glasses. I love the way he has chosen to have his shirts cut long in the cuff, and direct his tailor to dispense with adjusters to keep down with the folk by using a belt. Anyone know what gel he uses? 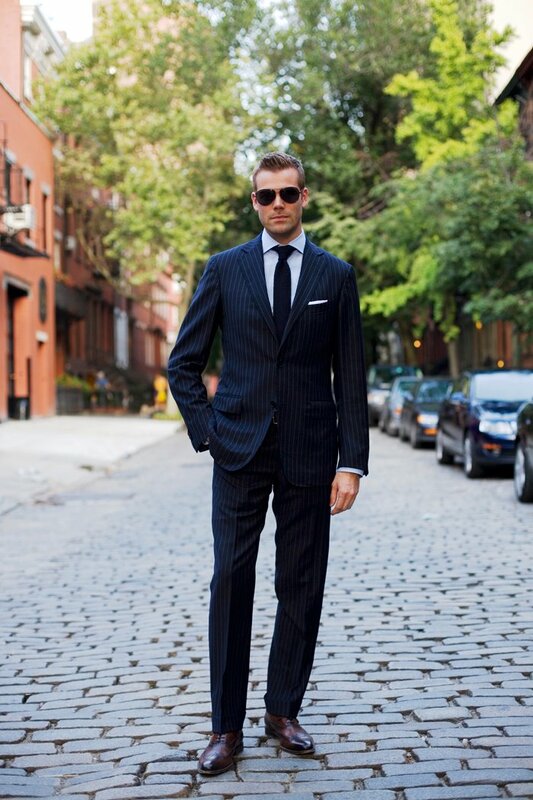 I normally hate pinstripe, but when it fits this well…he can pull it off, no problem. Yes, Yes, Yes!!! Though I’m finding it hard to differentiate the man and the mode! “Fitzwell” indeed. Very nicely cut, with a subtlety that can be appreciated by those with an eye for elegance. Boring? Not so! I find men who are dressed like well-dressed men much more interesting than men who are dressed like circus clowns. Nice outfit, but the hair and sunglasses ruin the whole. The guy looks like he was styled for a cheap shopping catalog. sweet mother of god, he’s pretty…..
Ohhh my my my my my! Verrrrry nice! He looks like he’d fit well on my sofa, too. LOVE the tailoring and the silhouette. The pants length is perfect – just different enough to keep the look from boring. meh. he looks like a secret service agent. albeit more well tailored than any I’ve ever seen, but it just seems a bit tame. mmmmmm… luv that suit.. mr. fitzwell definitely looks striking in this pic! Brown brogues with a blue pinstripe suit? Heresy. I agree that is an inch too short for his throwsers, I would still ask him to marry me. I love a man with good hair. Has he been on here before, by any chance? Beautiful, and impeccably tailored. Every man should take note and dress like this. He is perfect. I love the stripes. Oh, haha, took me a while to get it. Fits-well, as in it fits him well. Wow, I’m an idiot. I thought you meant a cross between Fitzgerald and Some-other-name-well. Very nice though, I love the way he executed the look. The hair, glasses, pocket square, tie, shoes. They all just work. wow yeah your blog is intense and cute !! im lovin this style !! I ´ll put on my favourites. A perfectly tailored look ! I like the creativity with his shoes. Far too many guys in New York only wear black shoes with their pinstripes. Secret Service Agent + Mr Fitzwell = Fitwell Smart? dishy – i would love to see his face without the aviators though. the suit’s not too bad either. Ahhh what a man! What a mighty good man…yes he is. your commentary made me laugh out loud. oh how dashing! why don’t more men like this exist? there is nothing sexier than a man in a beautiful suit. nothing. oh do visit my side of the world sometime!! Finally a smart, tight look that can be called “quintessentially American” with no hint of euro-inferiority complex. that suit looks like it was made BY HAND!!! It’s not boring when you see that walking over to you from across a room. WOW! That suit looks like it was made BY HAND!!! agree with waleed. – very much an example that money cannot buy style. – all details seem expensive… but there is little else happening. the berluti-esque shoes catch my eye – but that is not enough. – but then again i never liked berluti in the first place. Lovely, I think I might have to marry him. i wanna go out with this man! the attraction in this photo… is the desire to reach in and take his shades off! Those of you that think that his pants are too short: his trouser legs are very tapered, and quite narrow around the ankle. Although he could add a little, if he wanted a break, much more than a half an inch and he would have little puddles of material around his feet. Also, that cut of trouser is very Italian, and they typically want to show off their shoes, which I’m certain is the case here as well. everything is impeccable except for the tie. the knot is so sloppy… ugghh! Hi, I don’t understand, Why are you still in New York, while the Fashion week is happening in London ? those aviator shades give him a bit of a blank FBI anonymity… he seems a bit personality-less, like a perfect fashion android. I have been looking for such shoes all over!! What are those? FR? They are just a perfect color! Not just for this suit! This guy looks fantastic. It’s how I hope to look every day when I leave the house, and then when I see guys dressed this perfectly I realize how far short of the mark I fall. And then I’m kind of depressed. Second: Nathan……DO NOT compare yourself to anyone, but the guy in the mirror. Embrase your individuality and leave the house every day knowing that you did it your way! Looks like my wedding suit I purchase back four years ago from France– very nice. he looks almost TOO perfect. i want to muss something up a little just to throw the balance off. beautiful suit, beautiful man…love the shoes, love the suit, love the shades, love the shot! this is why i check your site everyday. I think this is a reminder that the fit is as important as the clothes you wear. Love the tayloring,love the shoes. I sense nice blue eyes behind the shades? Does Mr Fitzwell need a Mrs Fitzwell? Perfect suit! Mr. Friggingorgeous also applies to this guy. Americans like swimming in baggy fabric, which makes them look like they’re wearing hand-me-downs. The trousers and sleeves are perfect! With a suit this flawless, the imperfect tie knot is something of a relief. Total impeccability would be off-putting. The darker shoe polish on the brown brogues is a nice touch. Love the dark brown with navy blue. Black shoes with the pinstripe would be boring as hell–there’d be no real color relationship. Those hoary old rules about shoes are for amateurs. Epitome of a modern, handsome man. i won’t pretend i know about the fit of a suit but he is one fine looking man…no doubt. How can you lose? Everything’s perfect. A little sober, perhaps; but still perfect and little amazing and still looking fit for this suit. i agree that the length of the pants is perfect and show off his beautiful shoes… what a well-proportioned man – oh, and a well-cut suit! nathan: One reason I like this blog is it tunes my fashion eye. I live with Italians in Milano where fashion is almost a competitive sport so I would add that if you feel good about what you’re wearing, there is no reason whatsoever to get down because someone else looks better. I have seen the oddest sizes and shapes here in Milano who carry themselves with their heads up because they obviously enjoy what they are wearing and while they care what others think they also know that attitude affects how others perceive you so… if you like the clothes, play it like you don’t care what others think, even if you find yourself standing next to Giorgio Armani on a street corner! wow this guy is HOT!!! My name is Bond, James Bond…. Can’t say the same about the hair. Way too much product. His hair is too long for that style. He should do a dramatic, diagonal part to the side. What man! what man! Can I have this man as present for chrismas? uhuhuh! Can’t believe i’m the first to note that the jacket is cut way too short to be taken seriously. I am *such* a sucker for good tailoring. Check the angle of the lapels and the collar – they just look – *fast*. Beautiful. I think the length of the trousers is just right. I would never be able to take a meeting with this man – I’m sure I’d distinguish myself by jabbering and drooling like anything. Love a good suit with an even better fit. The shoes are the perfect shade too. Wasn’t this guy in the Matrix? diederik (van lede) thank you for once again doing a fabulous job. something was wrong with this fella… but i could not get to point at it. yeah, the jacket – horrible! Love a slim-cut trouser. Fits well indeed! The perfect man in black… dark gray rather. I share this concern because at times, the woman photos are not so ” professional” looking, or lack the attitude of I can have it all and look good while doing it. I would love to see woman photos who could pull this off. It hurts me that such good looking men exist. ZZ Top says it best: EVERY girl’s crazy ’bout a sharp dressed man! A little too prim for me. But I must say, fitzwell should be his name and he does look good. um…he looks amazing. Why aren’t there any guys who dress like this in college?? But the guy does have attitude; For better or for worse, depending on your views. Personally, I think he looks fine, though nothing special. Where is that pictured in NYC? His clothes fit really well but right now I’d really like his number. This is classic 60′s mod as reinterpreted by Joe Jackson in the early eighties. It’s sort of self-conscious and it telegraphs the man’s intent. It seems like he’s trying a little too hard. Almost the diametric opposite of cool. Those shades really cap off the look. The Brits used to say “blue suit/brown shoes = bounder.” Wrong again! IMPECABLE. Classic and trendy at the same time…Nice suit and tie…great haircut…wanna marry him! For sure a Zegna Milano suit!! This is for sure Ermenegildo Zegna! So Sophisticated! Just normal and formal. Not different or special at all. Forrget all the GQ rules about how pants should break, how wide the shoulders should be, etc!! If it looks good, and feels good, then it is good! He’s just a man in a suit. Tall men tend to look somewhat awkward in suits; something is always out of proportion and makes them look either a teenager wearing their dad’s suit or some hulking James Bond thug. Not this one, he looks perfectly proportionate. What a great suit! Minus the the gel and the sun glasses. I would do anything to get my husband to dress like this. I love men in tailored closed. Like the suit, like the name better. But it is flawless. Perfect example of the Man wearing the suit… the look is Ralph Lauren Black Label to perfection. I am going to sound really picky here, as much as I love the suit and that it fits well, but I think the hairstyle is not “classy” or elegant enough for the suit… there’s a mismatch happening here between the man and his suit… maybe it’s just me with that impression? wow, it’s easy to criticise in picture, but I have never run into that in NYC. My jaw would drop. It’s sharp. Jacket and style are just great, but trousers too short. Why can’t I find wingtips small enough for a woman’s foot? I want it sleek yet manly, like these. Sturdy. A stacked heel, but not too high. RSVP here if you have a link. I needed some inspiration for a bond- themed party. I pulled my look out of this, although it was maybe more Harry Palmer than J.B.
Holy Guacamole! Is this man ever the hotness?! Easy on the eye, but far from perfect. His Canali suit should fit better at the waist, in order to fit with the highly modern tie (as first designed by heidi slimane). The suit is perfectly balanced, but the full brogues have to go, definitely! andre – your eye is poor if you think that suit is Canali. They don’t make a shoulder like that, but thanks for playing. Does he have at least ugly eyes? Is it really his name? He surely have lived up to it. Sharp, smart. Perfect. Will read the comments afterwards. You make a great team for the co. and wish you both (all of us) much success moving forward. Sincerely looking forward to the opportunity of lending my passion & energy to the fold. THANKS AGAIN for intruducing us to the "WORLD" of Zegna!!! My Best to You, Miles & your entire familia! The sunglasses and hair cut probably do more for the look then the rest, but very clean GQ look. I love the fit and the stripes.